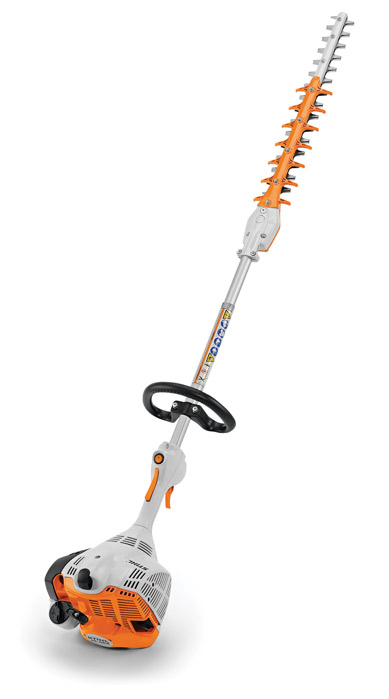 An extended length hedge trimmer with a convenient short shaft ideally suited for homeowner and entry-level landscaper use. Maintain hard-to-reach hedges with the STIHL HL 56 K (0°) extended length hedge trimmer. Designed for homeowners and beginning landscapers, this extended length hedge trimmer has a 26-inch short-shaft which makes it easy to handle. With its advanced, low-emission, powerful two-stroke engine, the HL 56 K (0°) is fuel efficient for a lower cost of ownership over time. It features a lighter gearbox than previous models, shifting weight to the powerhead for better balance and maneuverability. The fixed-angle 0° blade allows users to trim hard-to-reach areas smoothly and precisely.